Soda bread is one of the least worrying breads to make because there’s no yeast to deal with. Not that yeast is especially complicated stuff, it’s just that all the proving, warming, kneading, rising business can seem daunting in a way that adding a tsp of baking soda never does. 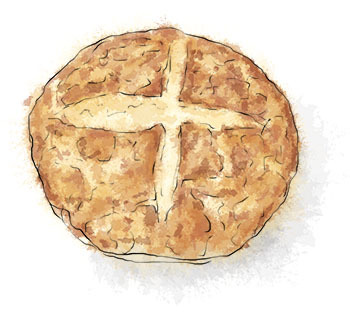 Traditionally soda bread is baked in a round shape with a cross cut into the top. There prosaic reason for this is that it helps let out some of the steam, but there are other religious and folkloric explanations. My favorite is that the cross lets out the fairies and evil spirits. How they got in there in the first place is not explained. I’ve been making Rachel Allen’s version of soda bread for 8 years. The recipe was written out for me by the very sweet Irish girl that I shared a bench with at cookery school. She’d enrolled on the course because she was going to get married to someone who expected her to cook for his shooting parties and the like, and, because apparently nobody had told her that the 1950’s were over, she was attempting to meet expectations. She was a naturally terrible cook, with no patience to follow a recipe, and the sunny yet misguided hope that everything would turn out fine in the end. After a month of burning, undercooking, over salting, forgetting the sugar, and butchering (not in a good way) she was ready to throw in the towel. That’s when a kind-hearted instructor took her to Waitrose and taught her how to buy ready meals, transfer them to her own cook-wear, and make a salad to go along side. This is what she duly did, and if her Christmas cards are anything to go by, it has been the recipe for a happy marriage – still set in the 1950s, with two children a red setter and a stately pile somewhere beginning with “Bally”. And yet, she could always, always turn out a perfect loaf of soda bread. It’s best eaten the day it is made because there’s nothing in it that acts as a preservative. This entry was posted in Uncategorized and tagged baking, bread, evil spirits, hunting party, soda bread. Bookmark the permalink. I’m going to try this! I was so busy before St. Pat’s day I didn’t make any. I’ll make some belated bread! I tried this today – I think I fiddled with it too much. I couldnt work out how wet or dry it should be. The inside was yummy but the crust was hard as a rock. thanks though I’ll keep trying. You know, it took me a few goes to get the hang of it too. Some things to try. Use strong flour, or at least, good quality flour. Seems to help. The mixture should be sticky. Like the kind of mess a child would make if you let them help. You kind of gloop it onto the tray. Put a tray of water in the bottom of the oven – the steam helps with the crust – especially if you have a fan over, which tends to dry things out quickly. If it’s still too dry outside, try cooking the bread in a preheated cast iron pot with the lid on – take the lid off for the last 10 mins, or tip the bread (really carefully) straight onto the bars of the oven shelf for the last five mins.